A Hustler in GTA San Andreas. The Hustler is a classic two-door coupe in Grand Theft Auto: San Andreas. 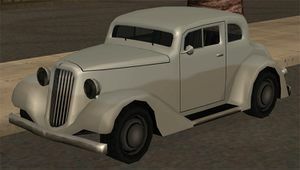 Like the Hotknife, the Hustler is one of the oldest cars in GTA San Andreas, evidently based on a 1933/1934 Ford Model B, mildly modified (most prominently featuring a chopped top and low ground clearance), but not to the extent of featuring the Hotknife's hotrod design. The Hustler corners sharply other than that it has modest performance. The Hustler has a pretty good ramming ability in contrast to its size. Although it doesn't appear to have a visible fuel cap, it will explode if the back license plate gets shot, as this was the same area the fuel cap was on the Ford cars up until the 1950s. The Hustler can be modified at a TransFender, but features very limited modification options. The default radio station in the Hustler is K-DST. The Hustler has the same engine sound as a Hotknife, but has the horn sound of a Sabre or Sunrise. Despite the fact that a Hustler was used by a pimp in "Jizzy", pimping missions cannot be done with the Hustler. Spawns while driving a Turismo on The Strip, Las Venturas (Tue). Spawns while walking around The Visage & Pirates in Men's Pants, Las Venturas (Thur). May also spawn under other conditions on the Strip, LV. Another Hustler, constantly painted green in line with the Grove Street Families' colors, is owned by Denise Robinson with the License Plate reading "HOMEGIRL", a reference to her life in the ghetto. It is constantly parked in front of her house in Ganton, Los Santos. Until the player reaches a 50% dating level with her, the car will remain locked. This page was last modified on 17 May 2015, at 03:00.